Many of you are familiar with the fantastic aircraft and armor releases from 21st Century Toys. Their early 1/18 scale P-51D Mustang and Bf 109E were simplistic, but still colorful hanging from the ceiling or sitting on the shelf. Since those early releases, in the aircraft category alone, we've seen some amazing subjects in continuously increasing levels of difficulty and detail. 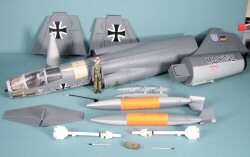 We have all in 1/18 scale: Ju 87 Stuka, F4U Corsair, P-47 Thunderbolt, P-38 Lightning, Spitfire Mk.I, P-40B Tomahawk, Fw 190D-9. Many of these have been released in several different color schemes. So if that list isn't impressive enough for you, you will recognize that these subjects have one thing in common - they're all World War Two veterans. That trend ends here and now. 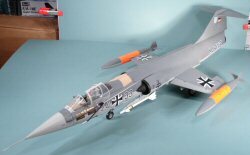 21st Century Toys has released the F-104 Starfighter in 1/18 scale! This example is a German Navy Marinefliegergeschwader 2 F-104G Starfighter, and it is very nicely done! You can see in the title image that the Starfighter is packaged in the same rugged, bullet-proof box that the earlier releases. Inside, each major component is wired to the carrier box with one or more tie-down wires, ensuring that no harm will come to the aircraft in transit. In times past, I've spent more time untwisting the tie-down wires than assembling the aircraft. With this release, I changed tactics - wire cutters! With a few snips, the Starfighter was free and clear of the packaging. 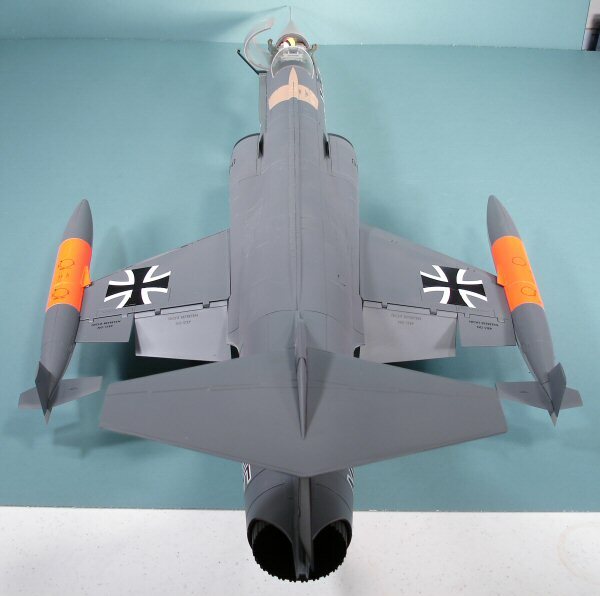 The main components of this release are the forward fuselage, rear fuselage, radome, wings, and horizontal stabilizer. The landing gear is up and locked for transit, but snaps down smartly when you're ready to set the aircraft on the gear. With a few snaps, the main components come together. This release features the fuselage-mounted AIM-9 Sidewinder dual launch rail with a pair of nice AIM-9s that mount securely to the launchers. 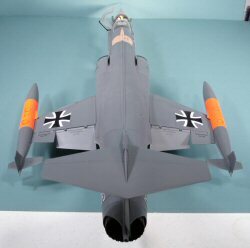 The wingtips receive tip tanks that are marked with International Orange as used by the German Navy during the majority of its Starfighter operations. A pilot figure is also included complete with parachute pack, oxygen mask, and a nicely decorated helmet. As has been the trouble with some of these cockpits, my figure would not fit onto the ejection seat with the parachute pack, so that was the first option to go. One of the legs would also pop out of the hip socket (ouch) when trying the straddle the stick and centerpost of the instrument panel. Eventually my pilot was coaxed into position and he's not coming back out again if I can help it! You can see in these photos how nicely done the aircraft finish is straight out of the box. I have done nothing to this model other than remove it from the box and snap it together. Well done! 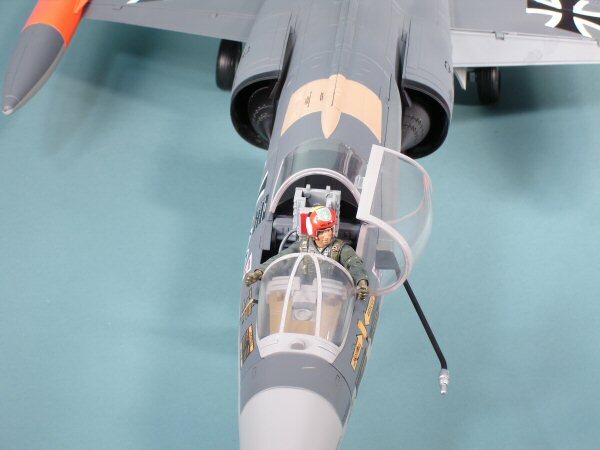 Among the working features of the F-104, the landing gear operates very nicely, the leading and trailing edge flaps are movable, as are the rudder and ailerons. The model also includes an air refueling probe and a pair of pitot tubes. I especially like that precaution as one of the pitot tubes was warped out of the box. While I may update the finish on the aircraft at some point, this F-104 looks great exactly as-is and is hanging over my desk in the Cybermodeler office. I may just have to find the F-104C also released to park on my desk at my 'day job' as well. This release is definitely recommended. You can find these at any one of the retailers listed on the 21st Century Toys website. My sincere thanks to 21st Century Toys for this review sample!